The ECONOLINE system is a system without thermal insulation, designed to construct internal partitions, both fixed and with windows and doors. The width of the profiles 51 mm (by 6 mm more than the standard widespread on the market) gives a lot of freedom for designers and comfort for contractors. The system allows the use of glazing sets from 3 mm to 38 mm thick. Glass panes are fixed and sealed in sash notches using glazing beads made of aluminum profiles and gaskets. The ECONOLINE system is compatible with other Aliplast systems: common glazing beads, gaskets, corners and fittings. In the Econoline system there is a version of door profiles with a specially profiled fitting eurorow used to fasten clamp hinges. A kind of complement is the INNERWALL subsystem, which is great for shaping office buildings - it is a raw skeleton to which varnished slats are shot. It is possible to use internal blinds here. - the possibility of constructing sliding and swinging doors, joining walls at any angle, and strengthening already made and even mounted elements. IMPERIAL is a three-chamber system designed for the construction of external doors, windows and various types of sites. The thermal break applied in the profiles, up to 24 mm wide, made of polyamide enriched with the addition of multi-directional oriented fiberglass, significantly improves the mechanical strength of the outer and inner chambers of the profiles. The thermal break is additionally equipped with a Coex sealing line, which during the firing process of the powder-coated profiles creates a reliable vapor barrier and perfect sealing. The IMPERIAL door profiles have a heat transfer coefficient Ur = 2.2 ÷ 2.3 W / m2K, which classifies them in the material group 2.1 according to DIN 4108. Thanks to the parameters: a large width of 65 mm profiles (window and door frames, posts, door leaves) and 74 mm (window sashes) and a wall thickness of 1.7 ÷ 2.0 mm, a rigid, stable profile was obtained enabling the door to be constructed with maximum wing dimensions: 1300 mm wide - at a maximum height of 2200 mm, width 1200 mm - at a maximum height of 2400 mm. The system of fixing the fillings: from 4 to 51 mm (allowing also glazing from the outside), the use of brand fittings and a wide range of threshold solutions makes the system very modern and versatile. The advantage of IMPERIAL windows is the possibility of proper sash selection to the window size (several types of window frames and sashes) and the choice of the sash depending on the fitting - there are wings for typical aluminum fittings, in accordance with the EURO standard as well as for PVC window fittings. System with increased thermal insulation. Thanks to three-chamber thermal breaks, chamber central gasket and special glazing gaskets, the system achieves UR <2.0 W / m2K (material group 1.0 according to DIN 4108). The depth of window frames and profiles for fixed buildings is 75 mm. Depth of window wings 84 mm. The Superial system is based on accessories (corners, T-connectors) as well as glazing beads and fittings from other thermally insulated systems. The system achieves very good acoustic properties. The possibility of using fillings with thicknesses of 14-61 mm. MB-45 is a modern aluminum system used for making architectural elements of internal and external construction that do not require thermal insulation, eg: various types of partition walls, windows, doors, including manually and automatically moved doors, swing doors, vestibules, shop windows, boxes cash registers, display cases, spatial structures. 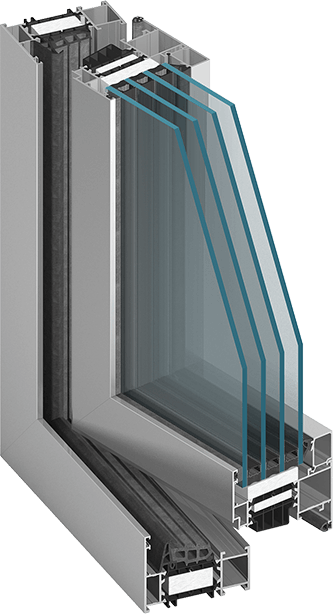 The structural depth of the window sections is 45 mm (frame), 54 mm (casement), and the door is 45 mm and 45 mm respectively. Such assumed depths of the sash and frame sections give the effect of one plane from the outside after closing - in the case of windows and the effect of flush surfaces of the sash and frame - in the case of doors. The shape of the profiles allows for slender and durable window and door constructions. An important advantage of the MB-45 system is the possibility of bending profiles, including door frames, wings and lacings, which allows the construction of various types of arches and arch structures. Tightness is ensured by the use of special gaskets made of EPDM synthetic rubber, which guarantees resistance to aging during many years of use. A characteristic feature of the system is its strict connection with window and door systems. The versatility and attractiveness of the system is additionally increased by the possibility of choosing between several variants of solutions, in the case of various construction details, eg sealing the bottom door wings, sealing sliding and swinging doors, the shape of glazing beads, the shape and height of door thresholds. 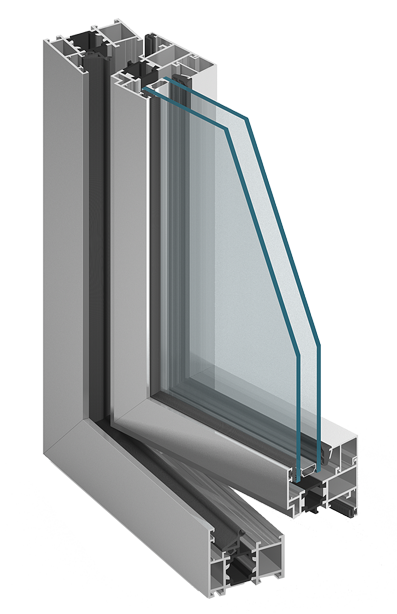 The system allows the use of glazing sets from 2 mm to 35 mm in window sashes and from 2 mm to 26 mm in fixed windows and door leaves. MB-60 is a modern aluminum system, used to perform architectural and external elements requiring thermal and acoustic insulation, for example: various types of windows, doors, vestibules, sites, spatial structures. The system profiles have a three-chamber structure. The structural depth of the window sections is 60 mm (frame), 69 mm (leaf) and the door is 60 mm and 60 mm, respectively. Such assumed depths of the sash and frame sections give the effect of one plane from the outside after closing - in the case of windows and the effect of flush surfaces of the sash and frame - in the case of doors. The shape of the profiles allows for slender and durable window and door constructions. There is a possibility of bending profiles, among others door frames, wings and lacings, which allows the construction of various types of arches and arch structures. The MB-60 system is characterized by a low value of heat transfer coefficient U due to the use of thermal breaks and gaskets. For MB-60 system profiles, Uf heat transfer coefficient is: for windows: from 2.0 W / m2K, for doors: from 2.30 W / m2K. The system uses profiled thermal breaks in the shape of omega with a width of 24 (windows) and 14 (doors) mm made of polyamide reinforced with fiberglass. The shape of the spacers increases the stiffness of the profiles in relation to the flat spacers and facilitates the drainage of sections thus ensuring proper thermal insulation in all weather conditions. The threshold made of HPVC and EPDM gaskets guarantee good thermal insulation of door leaves and water and air tightness. A characteristic feature of the system is its strict connection with the window and door systems MB-45, MB-59S and MB-70. The adoption of such a construction assumption made it possible to obtain and apply many compatible elements in these systems, eg: common glazing beads, corners, sealing strips, glazing and rebate gaskets, common fittings, locks, hinges and many identical technological processes as pinning switches for battens and crossbars, bonding corners, punching different recesses, etc. One of the effects of this unification is that the appearance of both external and internal products: windows, doors, etc., made in various external or internal building systems is almost identical. The MB-60 system is the basis for solutions with increased thermal insulation: MB-60HI, MB-60USHI, MB-60E HI, MB-60EF HI. 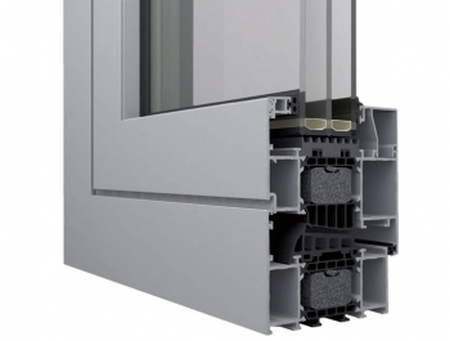 MB-70 is a modern aluminum system, used to perform architectural and external elements requiring thermal and acoustic insulation, for example: various types of windows, doors, vestibules, sites, spatial structures. The system profiles have a three-chamber structure. 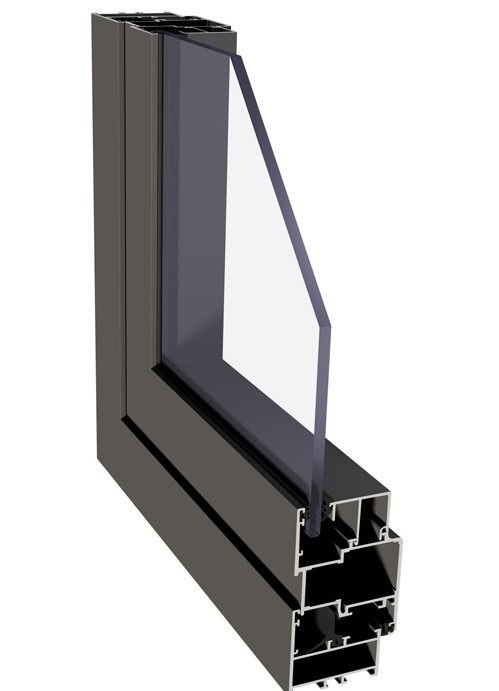 The structural depth of the window sections is: 70 mm (frame), 79 mm (leaf), and the door is 70 mm and 70 mm, respectively. Such assumed depths of the sash and frame sections give the effect of one plane from the outside after closing - in the case of windows and the effect of flush surfaces of the sash and frame - in the case of doors. The shape of the profiles allows for slender and durable window and door constructions. The MB-70 system is characterized by a sensationally low value of heat transfer coefficient U due to the use of special thermal breaks and gaskets. This is of great importance in the era of growing requirements in the field of energy management and environmental protection. The Uf factor for the construction of the MB-70 system depending on the profiles and accessories used is from 1.5 to 2.39 W / m2K. 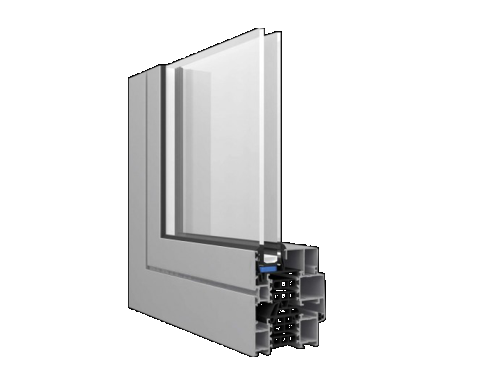 The system uses profiled thermal breaks in the shape of omega with a width of 34 (windows) and 24 (doors) mm made of polyamide reinforced with fiberglass. The offered shape of the spacers increases the stiffness of the profiles in relation to the flat spacers and facilitates drainage of sections thus ensuring proper thermal insulation in all weather conditions. 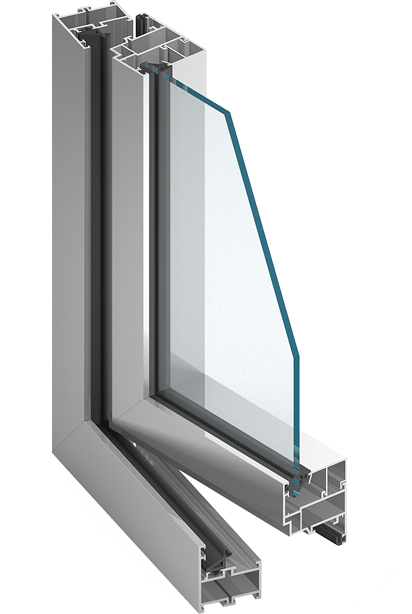 Thermal separators used in windows have additionally a seal at the joint between the section and the dividers, as well as projections dividing the chamber between internal and external aluminum profiles into three parts. Tightness is ensured by the use of special gaskets made of two-component synthetic EPDM rubber: solid and cellular, which guarantees resistance to aging during long-term operation and very good thermal insulation. MB-70 is the first system in which this kind of material was used to make the central gasket. 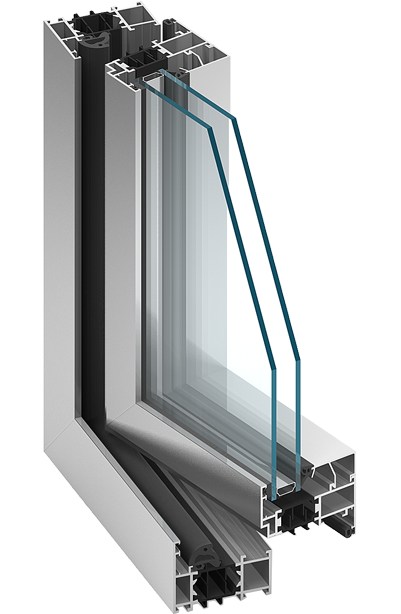 The system allows the use of glazing units from 21 mm to 57 mm in window sashes and from 12 mm to 48 mm in fixed windows and door wings. Such a wide range of filling thicknesses guarantees the possibility of using all typical and non-standard glass panes. A large selection of colors in the standard palette allows to meet the needs of the most demanding customers. Color coatings are made by powder coating or anodizing. 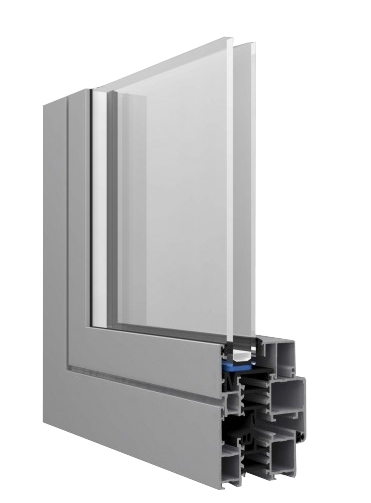 The MB-70 system is the basis for solutions with increased thermal insulation: MB-70 HI, MB-70US HI and cold-and-warm facade based on MB-70CW I windows. The MB-86 window and door system is a product with very good parameters, giving the opportunity to meet various needs of users. The structure of its sections has three variants depending on the requirements of thermal energy savings: ST, SI and AERO. MB-86 is the world's first aluminum window and door system that uses airgel - a material with excellent thermal insulation. The strengths of the MB-86 system also include high strength of the profiles, enabling the construction of structures with large dimensions and weight. On the basis of the MB-86 system you can also make panel doors that give you a lot of aesthetic possibilities and are able to meet the expectations of the most demanding users.